Apple CEO Tim Cook attributed slower sales in China in part to the devaluation of the yuan. Much of Apple's growth in China has come from the sales of its marque product — the iPhone. However, Apple had to revise its earnings forecast downward in the winter quarter, largely due to slower iPhone sales in China. Cook attributed slower sales in China in part to the devaluation of the yuan. "Because the local currency devalued over the course of the year," he said, "our prices did go up there, more so than did in regions that are U.S. dollar denominated." In response, Cook said, Apple has cut prices in China to be in accord with prices before the currency devaluation. "We'll see how that works out for us," he said. If the U.S. and China fail to reach an agreement by March 1, and the U.S. raises tariffs to 25 percent, analysts say, Chinese officials may retaliate and punish U.S. companies doing business there, further dampening Apple's ability to compete in one of the world's largest markets. Over the last year, Apple has also been in the process of rolling out a service that stores medical records from a variety of hospitals and providers in one place. On Monday, it announced a new partnership with the U.S. Department of Veterans Affairs, which will allow veterans using the VA's health services to use the Health app on iPhones. Cook says the app provides veterans with the ability to view their allergy conditions, lab results and medications in one spot. "This is part of our overall effort to really empower the patient," he said. "We can't wait to serve ... a population of folks that we really have great reverence for." A report by research firm CB Insights said "the market opportunity in healthcare is huge, and Apple sees healthcare and wellness as a core part of its app, services, and wearables strategies." The report said global spending in health care exceeds $7 trillion a year, dwarfing the size of the smartphone market. Officials at the VA and leaders at other health care facilities say Apple's strong emphasis on security and privacy is part of the reason they are partnering with the company on health records. Cook has been a vocal proponent of privacy, calling out companies like Facebook for using the personal data of its users to sell lucrative ads. 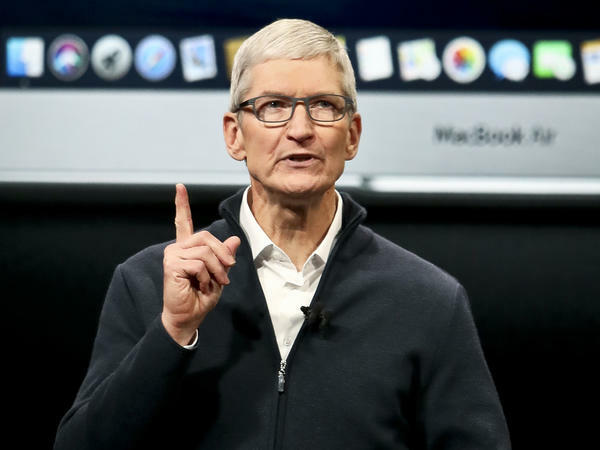 While Cook may be optimistic about China-U.S. relations, Apple may need to look elsewhere if it wants to keep up the pace of growth it's had for some 15 years.